A slew of companies are making progress exploring and mining for graphite in Africa. Here’s a brief overview of what they’re up to right now. Many investors are excited about graphite companies focused on North America thanks to Tesla’s (NASDAQ:TSLA) goal of sourcing graphite for its lithium-ion battery gigafactory from the region. However, North America isn’t the only place graphite can be found, and companies are seeking out deposits in other locales as well. Graphite in Africa is attracting interest, with companies focused on Madagascar, Mozambique, Namibia and Tanzania enjoying significant attention. With that in mind, we’ve put together a brief overview of companies producing and exploring for graphite in those countries. Read on to find out what they’re focusing on now. Bass Metals (ASX:BSM) — Bass Metals acquired its Madagascar-based Graphmada large-flake graphite mine from Stratmin Global Resources in 2016. The mine is currently going through an optimization process to improve cost efficiency — Bass Metals aims to ramp up annual production to 20,000 tonnes by 2019. Graphmada remains the company’s flagship asset, but it also holds the Mahefedok and Loharno deposits in the country. Trial mining began at Mahefedok in January 2016. Lithium Australia (ASX:LIT) — In March 2017, Lithium Australia’s subsidiary BlackEarth Minerals acquired the exploration rights for Capricorn Metals’ (ASX:CMM) Madagascar-based graphite assets. They are at an “advanced evaluation stage,” and cover two project areas. An IPO for BlackEarth is set to take place, with Lithium Australia retaining exposure to its graphite assets. NextSource Materials (TSX:NEXT) — NextSource Materials, previously known as Energizer Resources, is developing its Molo graphite project in Madagascar. Molo is one of the largest-known and highest-quality flake graphite deposits in the world, and the company believes an updated feasibility study released this past June could be game changing. It will involve a fully modular, two-phased build methodology and has dramatically reduced the CAPEX required for Molo — click here for full details on the study. NextSource is targeting commissioning and production in 2018. Syrah Resources (ASX:SYR) — Syrah Resources is moving forward at its Mozambique-based Balama graphite project, which it says holds the largest graphite ore reserves in the world at 81.4 million tonnes at 16.2 percent total graphitic carbon. As of May 2017, the Balama processing plant was 80 percent complete and was expected to being production in Q3 2017. Syrah expects Balama to produce about 350,000 tonnes of graphite concentrate per year for the first 10 years of its life. Triton Minerals (ASX:TON) — Through its 80-percent stake in Grafex, Triton holds eight exploration licenses in Mozambique, six of which have been granted and two of which are in application. Together, they make up three projects: Balama North, Balama South and Ancuabe. In July 2017, Triton raised AU$1.23 million via a strategic placement with Shandong Tianye Mining, its largest shareholder. The money will be used for the definitive feasibility currently underway at Ancuabe; it is scheduled to be completed in December 2017. 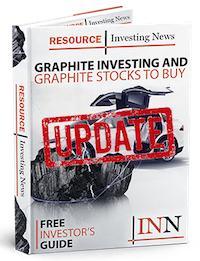 CKR Carbon (TSXV:CKR) — This past summer, CKR Carbon increased its stake in the Aukam graphite project in Nambia to 63 percent; the remaining interest is held by Next Graphite (OTCMKTS:GPNE). Aukam is the country’s only historical graphite project, and put out 25,000 tonnes of the metal between 1940 and 1974. The company recently submitted an environmental impact assessment to Namibia’s Ministry of Environment and Tourism for an operation expected to produce 5,000 tonnes of graphite per year. Magnis Resources (ASX:MNS) — Magnis Resources is a near-term graphite producer whose Nachu project is located in Tanzania. In March 2016, the company released a bankable feasibility study for the project. More recently, the company has focused on planning out infrastructure, including road upgrades, engineering for a water storage dam and a village relocation project. Volt Resources (ASX:VRC) — Volt Resources, formerly known as Mozambi Resources, is focused on the exploration and development of its wholly owned Namangale graphite project in Tanzania. A prefeasibility study for the project calls for annual output of 170,000 tonnes of graphite concentrate; Volt is currently working on completing a definitive feasibility study for Namangale. Walkabout Resources (ASX:WKT) — Walkabout Resources is exploring for both coal and graphite, and holds the Lindi graphite project in Southeastern Tanzania. In Q2 2017, Tanzania’s National Environmental Management Council issued an environmental certificate for the project; it will allow Walkabout to finalize its mining license application. Walkabout also has a prospecting license for its Kimoingan graphite project in Northeastern Tanzania. This is an updated version of an article originally published by the Investing News Network in 2015. If we’ve missed a graphite company in Madagascar, Mozambique, Namibia or Tanzania that you think should be included, please let us know in the comments! All companies had a market cap of at least $5 million at the time of publication, and were listed on the ASX, TSX or TSXV. Securities Disclosure: I, Sivansh Padhy, hold no direct investment interest in any company mentioned in this article. Editorial Disclosure: Lithium Australia, Magnis Resources and NextSource Materials are clients of the Investing News Network. This article is not paid-for content. Thank you for pointing this out! The information has been updated accordingly, and we apologize for the oversight.